From checkerboard hat to big spooky eyes, this hanging ghost decoration is hauntingly fun for your Halloween home! A quick, easy treat for holiday decorating, our hanging ghost’s light, billowy sheet gently sways in the slightest breeze … scaring up extra oohs and aahs! 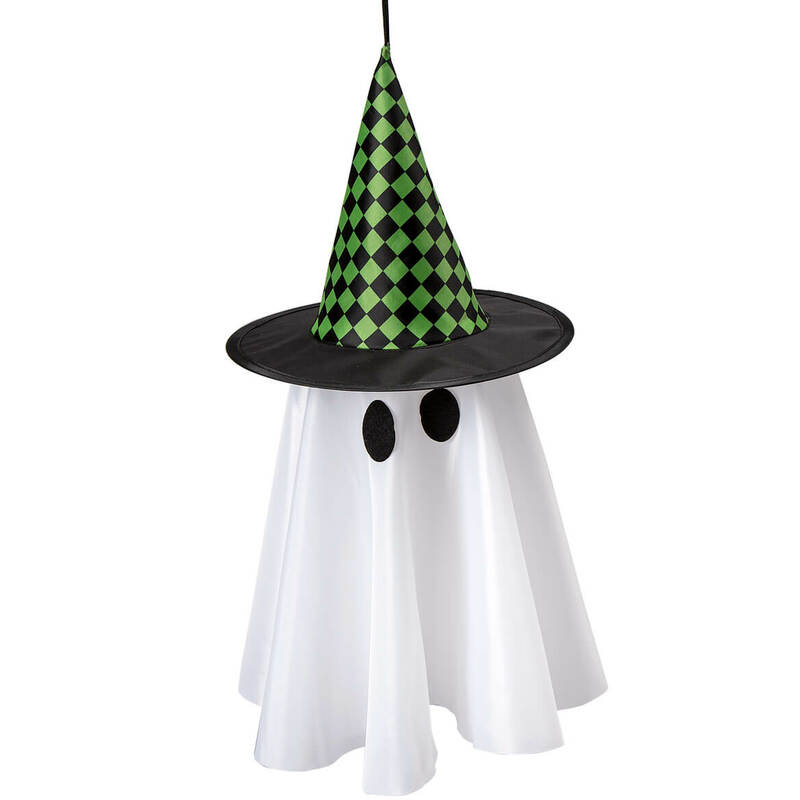 Arriving all ready to hang and enjoy, our Halloween ghost’s cute witch hat is available in two bright colors. Specify color: orange or green. 90% polyester/10% wire; for indoor/protected outdoor use. 10″ dia. hat includes 3 1/2″ hanging loop; 24″ long overall. 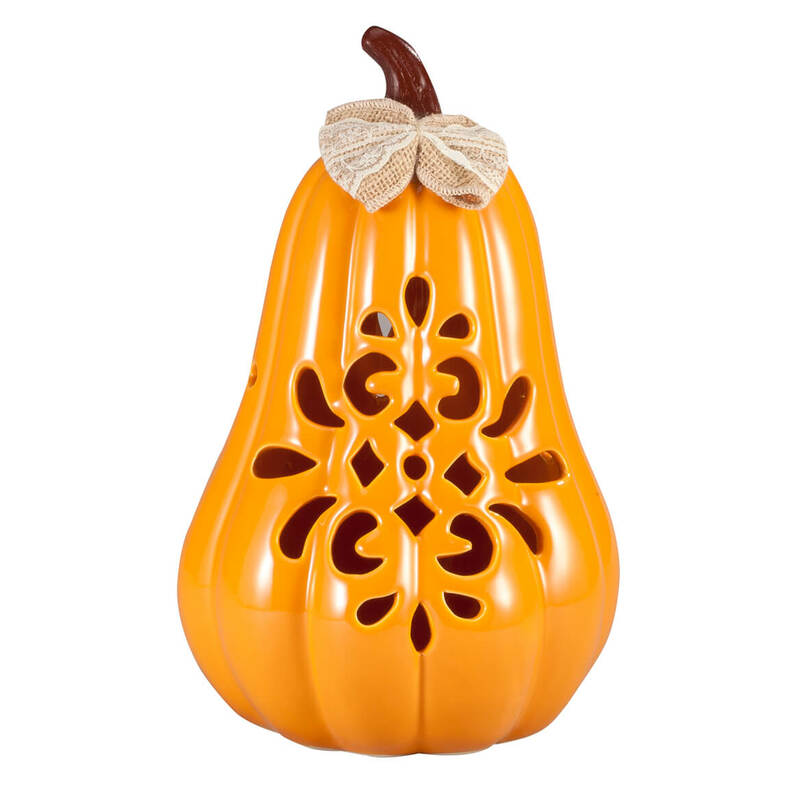 Ordinary jack-o’-lanterns can’t hold a candle to this large ceramic pumpkin, beautifully designed with intricate cut-outs on both sides. An artful alternative to a temporary jack-o’-lantern, it adds a bright pop of color and charm to your harvest home—commanding attention, year after year. Crafted of 100% ceramic with shiny orange glaze, this fall decoration’s brown glazed stem is topped with a decorative bow made of burlap and lace. For indoor use. Ceramic decoration measures 7″ wide x 11 1/2″ high. 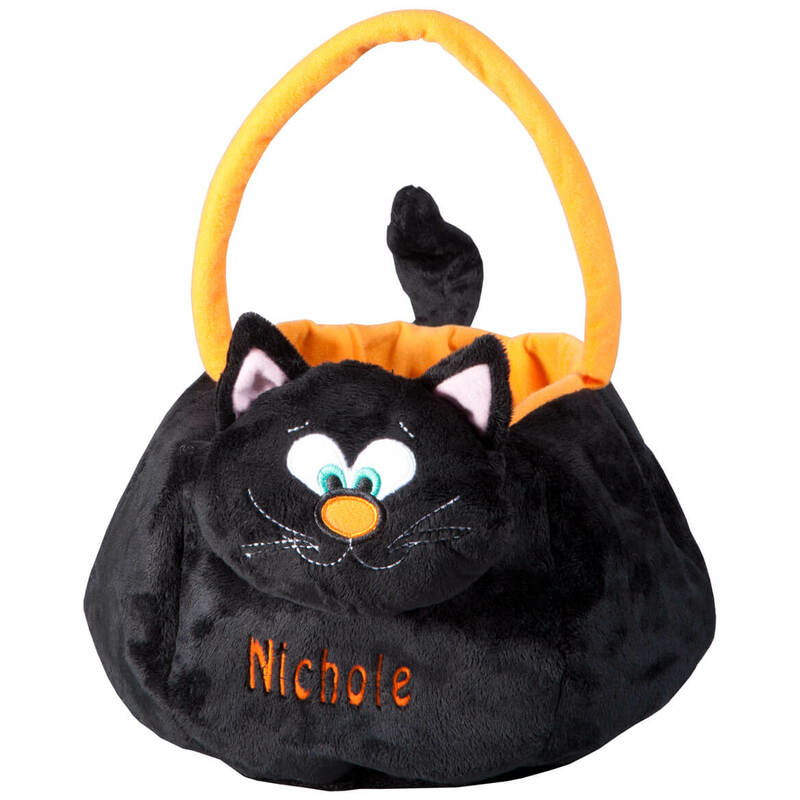 Plush, adorable and easy to carry … our personalized black cat trick or treat bag is anything but scary! Featuring a cute, kitty face and soft handle for holding, this trick or treat bag will hold loads of candy, and its long plush tail can be curled and shaped for added fun. When the candy’s gone, this personalized bag is great for toting toys to Grandma’s house … or snuggling up for a little cat nap. We’ll personalize for one lucky trick-or-treater. Specify name; limit 1 line, 10 letters/spaces. 100% polyester; spot clean. 10″ wide x 8″ high with 18″ drop handle. Candy not included. This personalized Frankenstein trick-or-treat bag holds treats galore—he’s personalized for added fun (plain bags are such a bore!). 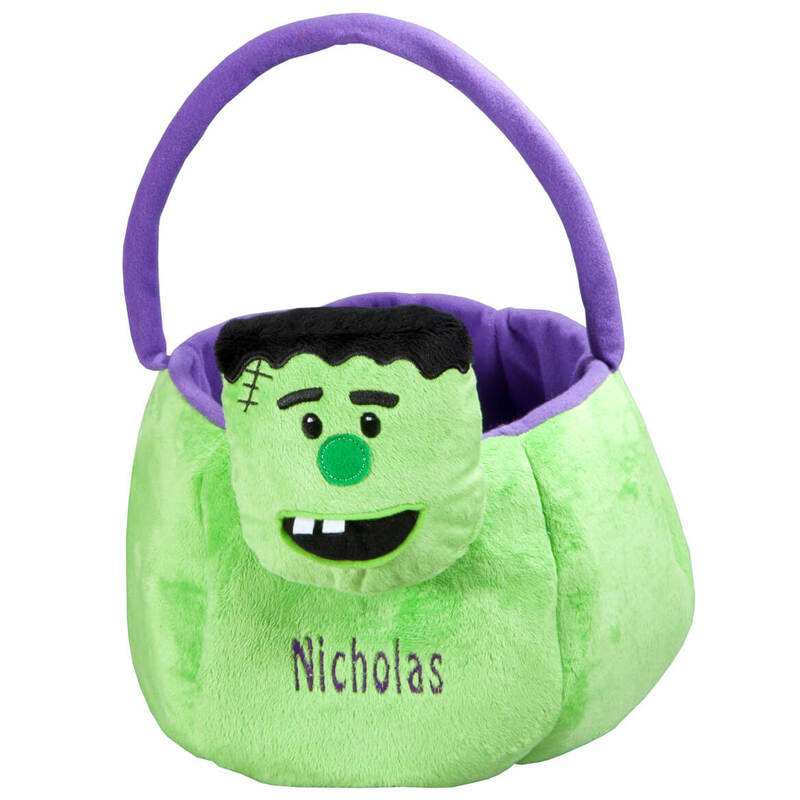 Our plush Frankenstein trick or treat bag is adorably NOT scary, featuring a big toothy grin, soft handle for easy carrying and big purple belly, awaiting trick-or-treat candy. When the treats disappear, this personalized bag is fun for toting toys, storing jammies, holding crayons and more. We’ll personalize for one special trick-or-treater. Specify name; limit 1 line, 10 letters/spaces. 100% polyester; spot clean. 10″ wide x 8″ high with 18″ drop handle. Candy not included. Smart decorators like you can skip the farmstand and give these small & medium ceramic pumpkins a starring role in your harvest décor—every year! So cute on a countertop, coffee table, fireplace or front porch, the decorative pair lends warm, artful style to any display. 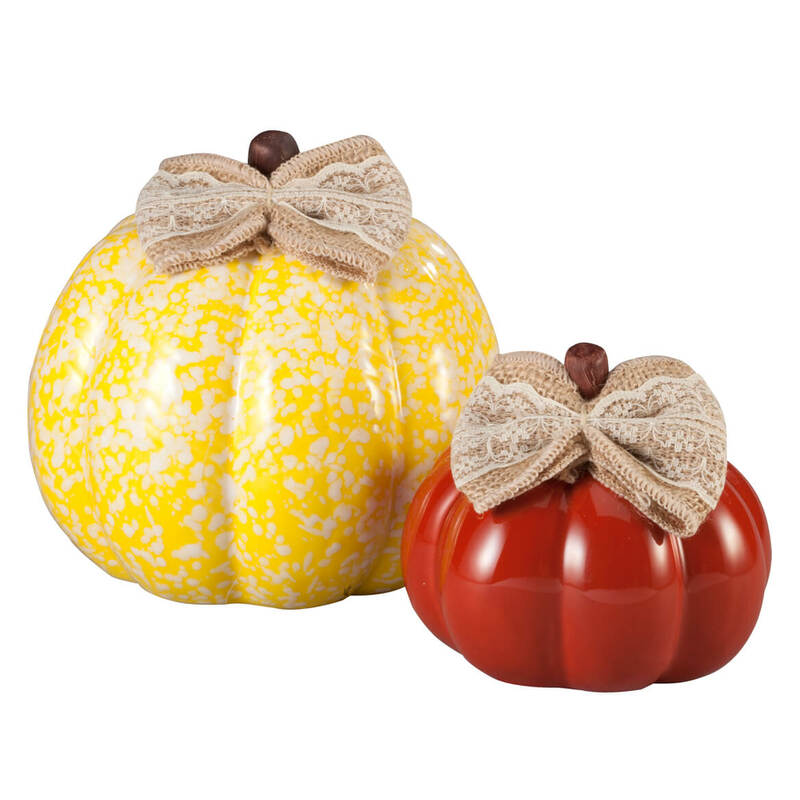 Crafted of 100% ceramic, the small pumpkin (4″ wide x 4″ high) features a burnt orange glaze, and medium pumpkin (5 1/2″ wide x 5 1/4″ high) boasts yellow glaze with pretty white speckles. Both are topped with a brown glazed stem and cute autumn bow made of burlap and lace. For indoor use. Set of 2. Keeping little ones cozy in holiday style, this personalized pumpkin baby hat will be personalized for your favorite little “punkin’ head”. 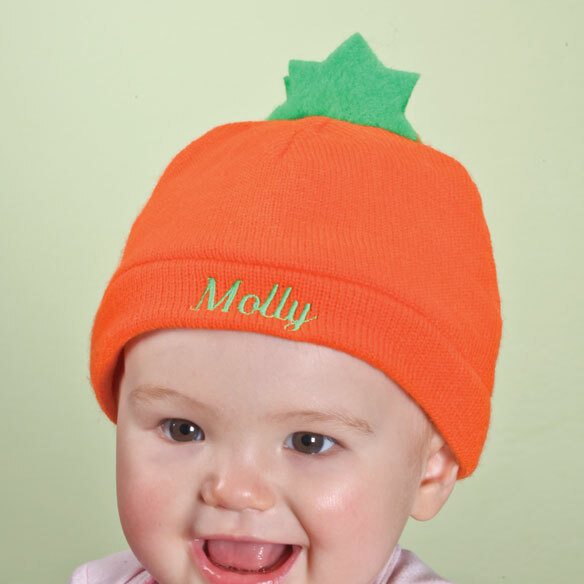 Fun for Halloween or Thanksgiving photos, the adorable knit baby cap features a layer of soft fleece fabric inside—cradling sensitive skin with light, itch-free comfort. We’ll personalize for an added treat! Specify name; limit 1 line, 8 letters/spaces. One size fits approx. 3-12 months. Custom hat made with 100% polyester; spot clean. Imported. Our prismatic Happy Halloween Jack-o’-Lantern Shimmer Light by Northwoods™ turns jack-ooooh-lantern as 10 miniature lights dazzle through his brilliant surface! We’re thrilled to share exclusive access to this festive outdoor light by Northwoods™, offering affordable style you won’t find elsewhere. Complete with suction cup for easy mounting to windows or walls, it’s UL® listed for indoor/protected outdoor use. Plastic. Decorative outdoor lighting measures 14″ wide x 16″ high; 60″ long cord. 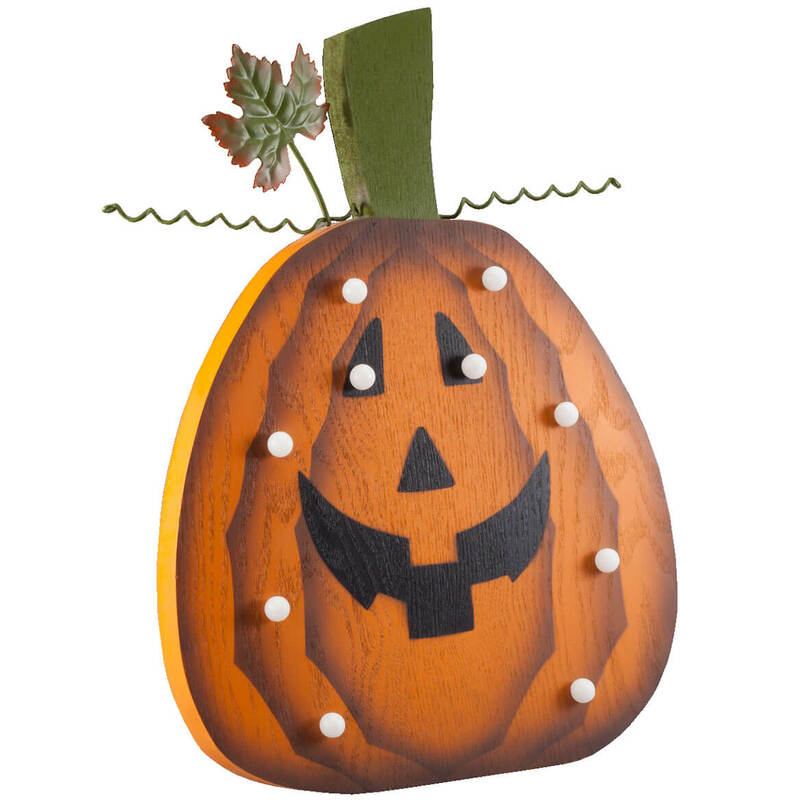 A treat for any Halloween home, this wooden lighted jack-o-lantern is adorably detailed and glowing with 10 bright lights! 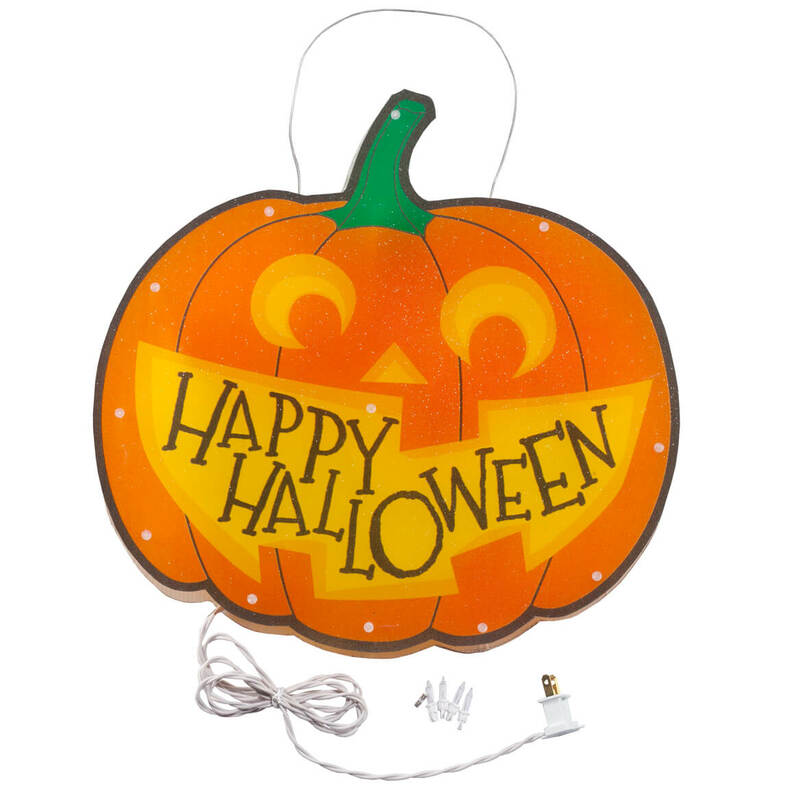 No tricks to display this decorative lighted wall art; he features a hook for easy hanging or peg on base for freestanding display. Includes on/off switch; uses 2 AAA batteries (not included). MDF, metal; for indoor/protected outdoor use. Wooden wall art measures 11 1/2″ long x 16″ high x 1″ deep.